ERR Alpha antibody LS-C682397 is an unconjugated mouse monoclonal antibody to human ERR Alpha (ESRRA). 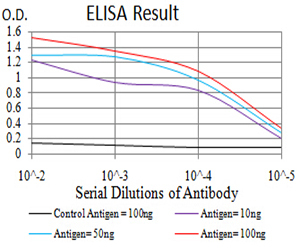 Validated for ELISA, Flow and WB. Purified recombinant fragment of human ESRRA (AA: 198-376) expressed in E. Coli. Western blot analysis using ESRRA mAb against HEK293 (1) and ESRRA (AA: 198-376)-hIgGFc transfected HEK293 (2) cell lysate. Western blot analysis using ESRRA mouse mAb against C6 (1) cell lysate. 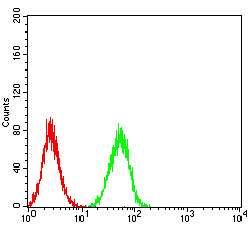 Flow cytometric analysis of Hela cells using ESRRA mouse mAb (green) and negative control (red).